Figure below. 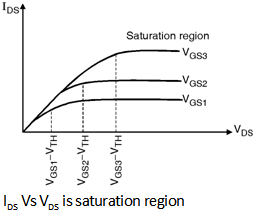 In fact as shown in Figure IDS becomes relatively constant and the device operates in the saturation region. i.e. Inversion layer charge density is proportional to (VGS - V (x) - VTH). Thus if V (x) approaches VGS - V TH then Qi (x) drops to zero. In other words as shown in Figure below if VDS is slightly greater than VGS - VTH then the inversion layer stops at x Â£ L and we say that the channel is 'pinched off'. As VDS increases further the point at which Qi (x) equals zero gradually moves towards the source. 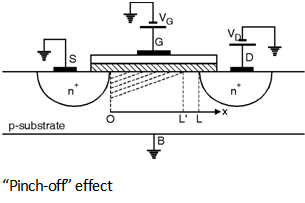 Thus at some point along the channel the local potential difference between the gate and the oxide silicon interface is not sufficient to support an inversion layer. Equation (8.3.13) must be taken from x = 0 to x = LÂ¢, where LÂ¢ is the point at which Qi (x) drops to zero and that on the right side from V (x) = 0 to V (x) = VGS - VTH.